Add enough water to a medium saucepan to cover about 1 or 2 inches from the bottom. Simmer the water over medium heat. In a smaller saucepan, combine the egg yolks, sugar and lemon juice, whisk until well blended. Reduce the heat to low, place the smaller saucepan on top of the larger one. Whisk the egg mixture until thickens, about 8 to 10 minutes (the curd will turn light yellow and coats the back of the spoon). Remove from the stove, and add butter one piece at the time, allowing the piece to melt completely before adding another. Transfer to clean sterilized jars. Refrigerate for up to 2 weeks. 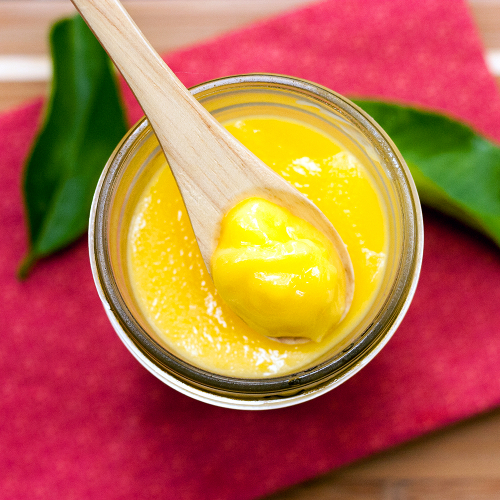 I am sure your lemon curd taste really good from the colour. It is handy to have a jar of lemon curd in the fridge cos it can be used to make all kinds of desserts. 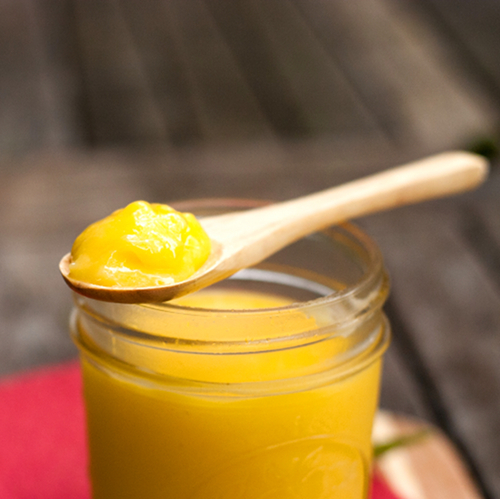 i just adore lemon curd, great idea to use the meyer lemons! love this! That looks so good. I love the flavour of lemon!! !